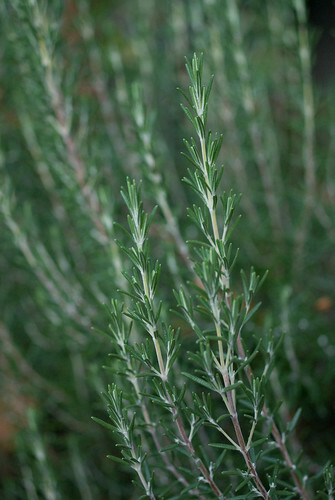 Rosemary is an absolute must. It grows like a weed in this climate, apart from the occasional hard frost, and I wouldn’t want to do without it. Our house came with an enormous Tuscan Blue plant established in the backyard, and I have to dissuade it from taking over the garden by whacking off several feet of new growth every spring. I also have an “Arp” in the front, in a difficult dry sunny spot. It’s blooming its little head off this year. Fresh thyme is a wonderful thing. 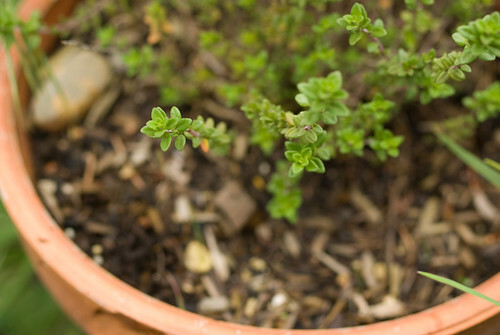 I have different varieties of thyme all over my garden, especially out in that difficult area by the sidewalk- lemon, lime, and Doone Valley – but I always make sure to have a pot or clump of regular culinary thyme. It’s not as tidy a grower as some, but a branch or two in a pot of beans provides a flavor nothing else can match. And when it blooms it’s always covered in bees. 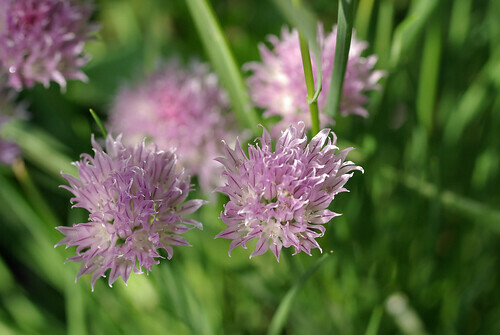 I love chives. I currently have two clumps, but I hope to work up to several more. 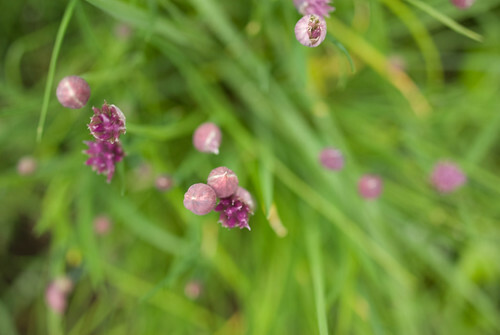 The season for snipping fresh chives is fairly short, so I tend to look for excuses to use it in the early spring before the tender sprigs toughen up. Scallion-chive breads are an absolute necessity, and anything involving cream cheese, goat cheese or eggs (not to mention crab risotto). 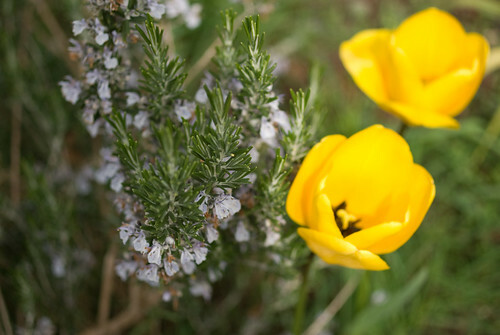 When the flowers bloom, petals can be included in the snips. I have trouble keeping crabgrass from growing up into my chives, so whenever I bring some into the house I make sure to sort through it and pull out the flat blades. I really need to do a better job of weeding. 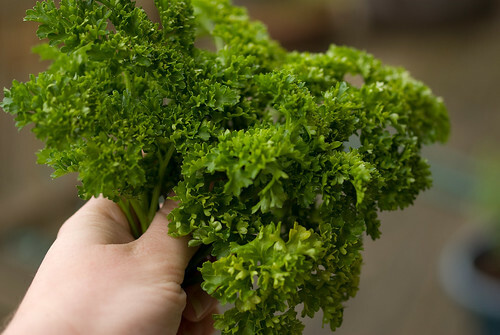 Parsley is a tender herb that I try not to be without. Every spring I buy a six-pack of starts and plant them out on the deck, which usually keeps me in tabouli all summer. It’s easy to grow and bug-free. I usually get Italian flat-leaf, but I have one plant of curly parsley that’s been hogging a container since last year. Spearmint is very important! 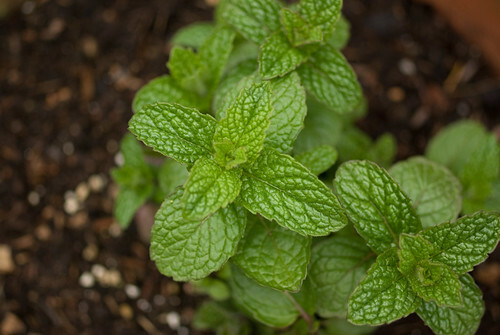 I don’t dare plant mint in the ground, as it would probably join forces with the buttercup and bindweed and take over the neighborhood, but I always keep a pot of it going, sometimes two or three. Fresh spearmint (not peppermint, mind you) is indispensible for mint juleps, mojitos, and our favorite lamb noodles with yogurt. We go through a lot of it. 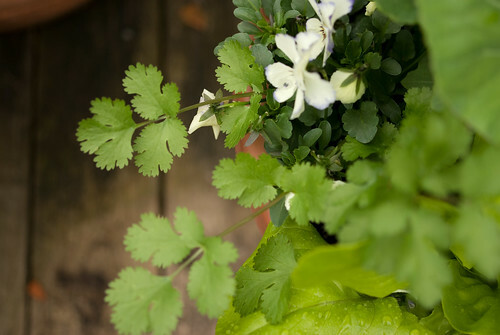 Cilantro is an herb that I love, but seldom grow. 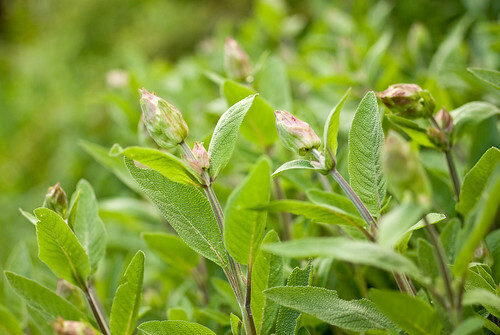 This year I have a few starts tossed into pots alongside leafy greens and flowers – not enough for cooking, but it should provide the occasional garnish over the summer. Back when I had a full-sun garden I grew vast amounts of cilantro from seed, which was wonderful. And then there’s fennel. 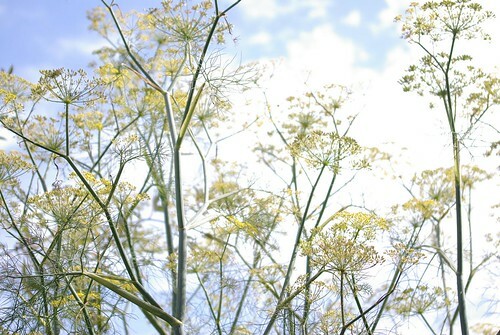 When we lived near the sea bluffs in California, I would walk through the fields of wild fennel and inhale the fragrance of it. 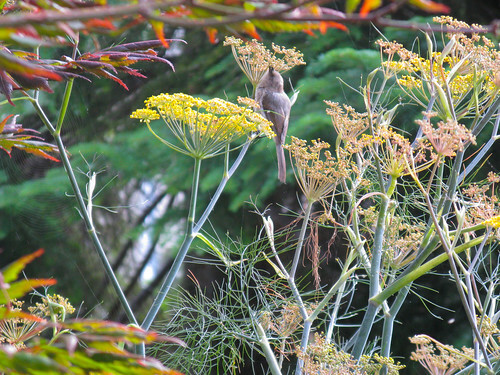 When I began gardening, I discovered the existence of bronze-leafed fennel, bought a plant, and now have an inexhaustible supply, as it’s an enthusiastic self-seeder. When the plants are allowed to establish, they get to be six feet tall and over a foot across at the base, and the only care they require is pruning out the old stalks in the early spring. 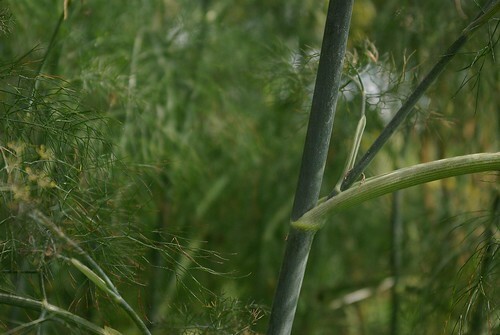 Note that this is a different variety than Florence, or bulb, fennel – there’s no bulbous root here to eat – but the leaves and seeds are edible. I sometimes harvest the seeds, but mostly I leave them for the adorable tiny birds that come through every winter and cling to the branches. 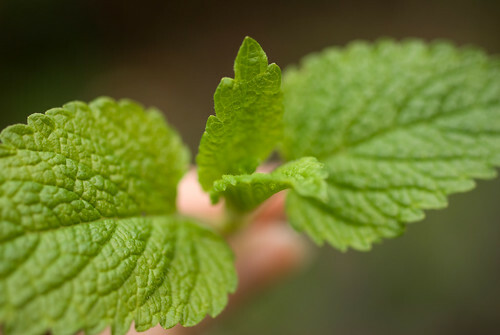 I may as well mention lemon balm, or melissa, as I will probably never be rid of it. This also came from my mother’s garden, planted by me with the thought of repelling mosquitoes and maybe flavoring iced tea. In truth, I’ve seen loads of mosquitoes around the plant, and rubbing it on skin has no effect at all except to make yourself smell like a citronella candle. 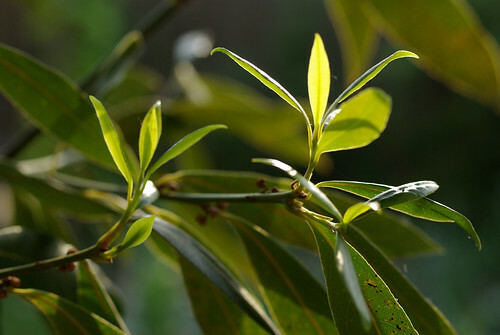 The leaves are pretty enough and the scent is bright and lemony (although a bit reminiscent of furniture polish), but it spreads quickly, is hard to dig out and needs to be pruned to the ground twice a year to keep it tidy. I’ve found clumps of it coming up in remote parts of the garden, presumably transmitted through compost. Or magic. I may have put a leaf in a glass of tea once. Perhaps. I’ve just added oregano and tarragon this year. I had an oregano plant for a while, but it got eaten by the sage bush. I recently planted a healthy start in a pot on the deck where it should get plenty of sun, and I just made a batch of chimichurri with it. The hailstorm we had last week knocked it pretty flat, but it looks vigorous enough to rebound. 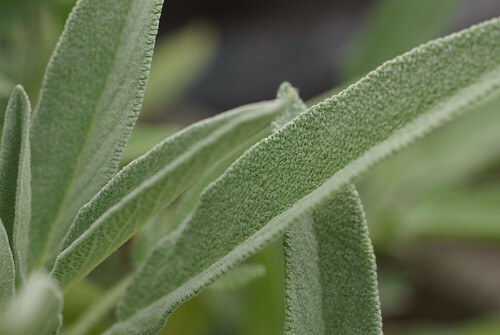 Tarragon is something I’ve never grown, and I hear it’s finicky and delicate. I love the occasional tarragon-scented sauce for fish, though, so I’m hopeful. 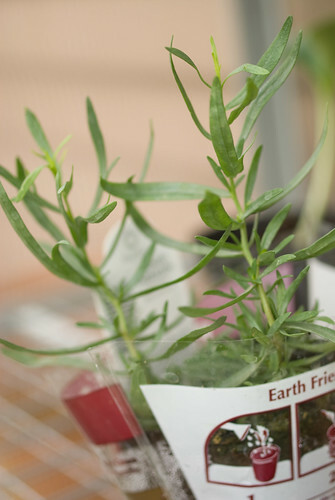 It will probably go in a container as well – it’s currently in one of those plantable peat pots. 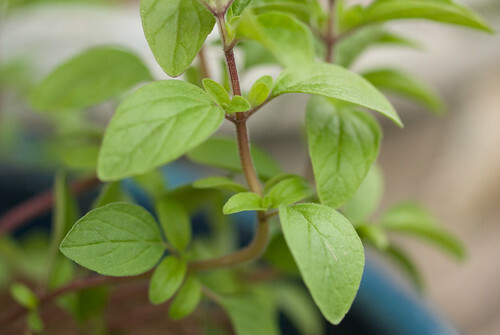 What herbs are you growing this season? Don’t we also have some oregano growing in the sidewalk strip? 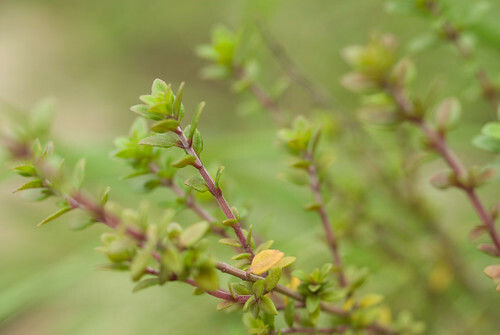 Or is that marjoram? Or something else entirely? I think it’s marjoram, but I’m not really sure since it came with the house. Forgot about that one. We’ve never cooked with it, in any case.